Pre-Purim Hamatshen making at Hebrew School Purim Family Day at Hebrew School! Imagine a Hebrew School where kids don't want to miss a day. They come in with a smile and leave humming a Hebrew song. Walking through the halls, you can hear the sounds of lively discussion, of singing, laughter and prayer. Imagine a child who feels the warmth and spirit of Judaism. Imagine the pride of his/her parents. 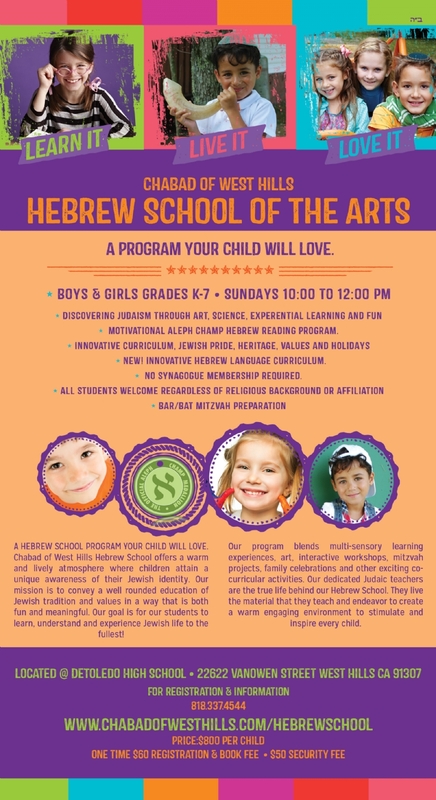 Welcome to Chabad Hebrew School, an exciting and innovative educational program in West Hills. Our School enjoys a well-earned reputation as a trend setter in creative Jewish education for children in Kindergarten through grade 7. Chabad Hebrew School has exciting new programs, a dynamic staff and interested students. Our student body is made up of children from various backgrounds and affiliations. Synagogue membership is not required. At Chabad Hebrew School of West Hills the traditions of Judaism come alive. We believe that a child’s Jewish education must be creative, memorable, and fun. You can be confident that our dynamic programs will educate, stimulate, and excite your child. Your children deserve nothing but the best. Give them the gift of a Jewish education that will remain with them forever.